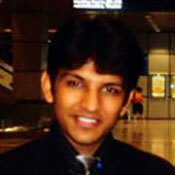 Shrey Goyal is a graduate of the Indian Institute of Technology at Kharagpur,India. While there, he founded a clean energy project, Urja, which has since been deemed an Ashoka’s Youth venture, and won the Oxford Youth Business Development Challenge in 2009, besides support from the Lemelson Foundation, Engineers Without Borders – USA, GE India, and the Al Gore Sustainable Technology Venture Competition. Shrey has previously worked in the spaces of innovation in microﬁnance and social enterprise consulting, and was a consultant for OECD-PISA with the World Bank, India. As a Villgro Fellow for2011-12, he is working with First Energy, Pune, a former BP subsidiary providing biomass-based clean energy solutions for low-income customers, and is rolling out their new village-level-entrepreneur model. Shrey is the founder of AnaGenesis, a social enterprise that provides research-based solutions as well as strategy and business development support to other social enterprises and international development projects across India, Haiti, and the US AnaGenesis creates experiential learning opportunities for students and young professionals, while facilitating Industry-Academia collaboration and promoting intercultural competence in the development sector.